Reversal of the normal cervical lordotic curve called kyphosis. Degeneration is the commonest cause of cervical kyphosis. As a part of aging process, degenerative changes may be seen at a single level and advances at adjacent levels or start at multiple levels simultaneously. 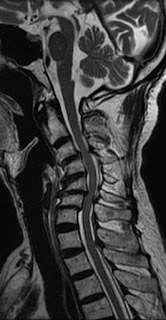 Disc show desiccation with reduced disc height, the weight-bearing axis of the spine is translated anteriorly, placing the posterior ligaments under an abnormal tensile load which in turn leads to further progression of the deformity by subjecting spine to additional load by head falling forward under influence of gravity. Reduced height of vertebral bodies with anterior marginal osteophytosis results in response abnormal stress due to anterior translation of weight bearing axis which further contribute in changing the normal shape and alignment of vertebral bodies and discs - a kind of vicious cycle. Cases of long-standing kyphotic deformities are at risk of development of Myelomalacia and spinal cord atrophy.